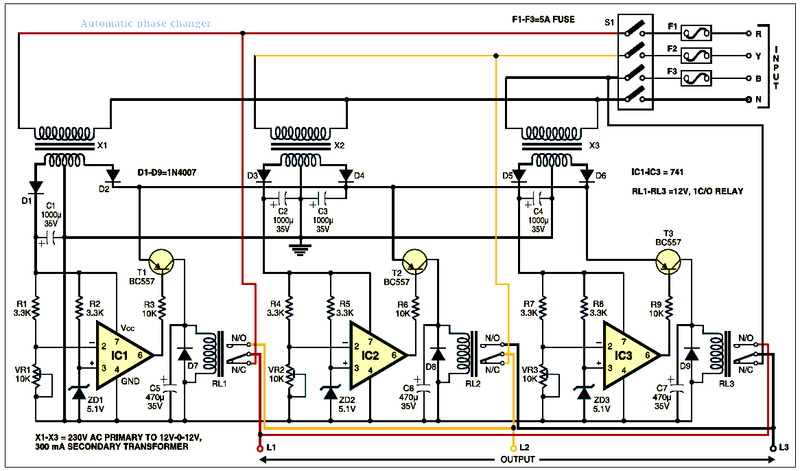 Automatic phase changer circuit ~ Engineering projects ideas for final year students & paper presentations collection blog. Department: EEE projects, electrical engineering, electronics engineering. 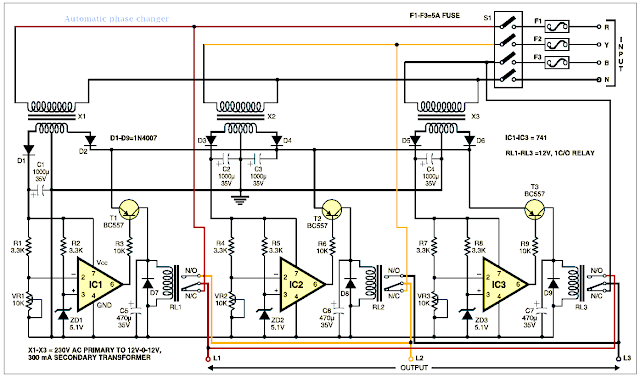 In three-phase applications, if low voltage is available in any or two phases, and you want your equipment to work on normal voltage, this circuit will solve your problem. However, a proper-rating fuse needs to be used in the input lines (R, Y and B) of each phase. The circuit provides correct voltage in the same supply line through relay from the other phase where correct voltage is available. using it you can operate all your equipment even when correct voltage is available on a single phase in the building. The circuit is built around a transformer, comparator, transistor and relay. Three identical sets of this circuit, one each for three phases, are used. Let us now consider the working of the circuit connecting red cable (call it ‘R’ phase).